Carpenter went 1-for-5 with a two-run home run in a win over the Giants on Sunday. Carpenter put a bow on the scoring for the Cardinals with an impressive 425-foot shot right in the eighth, surprisingly his first homer of September. 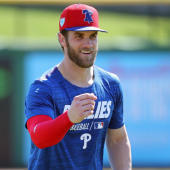 Carpenter has reached safely in six straight games, but he's slumped badly at the plate during the month to the tune of a .178/.315/.247 line across 89 plate appearances. While a .255 BABIP during that stretch could be partly to blame, a bigger culprit is the eight-point-plus bump in strikeout rate (20.8 percent to 29.2 percent) that Carpenter has seen compared to August.